Last year Proboscis collaborated with a group of local people and a community run centre (PAG) in Pallion, Sunderland to co-create and co-design a sustainable ‘knowledge network’ that could help people respond to the bewildering array of changes taking place in the benefits system. 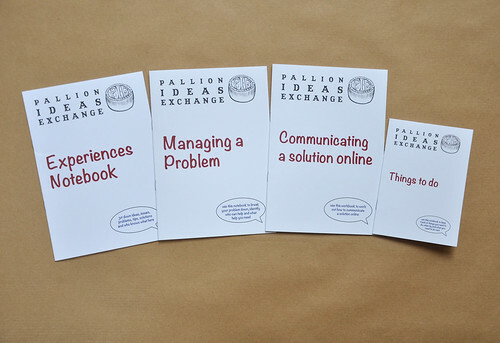 Our project became the Pallion Ideas Exchange (PAGPIE) – weekly meetings and get togethers run by and for local people to help each other identify and address problem, share information and experience and help share the results with others in the community. A key part of our collaboration (the project was also part of the Vome research project led by Dr Lizzie Coles-Kemp at the Information Security Group of Royal Holloway University of London) was the tools we designed to help the community think through not only how they could identify problems and opportunities, but also how they could figure out what they as individuals and as a group already knew and could share with others. All the tools were designed to be easily produced/reproduced using standard office stationery or, in the case of the larger posters, could be cheaply printed at a local copy shop. Everything was also designed to be easily captured for sharing on the web via blogs, twitter, facebook etc – in whatever way was both safest and most appropriate for the local community. We devised simple workflows, diagrams and ‘thinksheets’ as well as developing some workbooks and notebooks that individuals could use – all made with bookleteer. We printed up a batch of each using the Short Run printing service, but a key part of the design was that anyone could easily download, print out and make up more copies if they needed to, or the centre could easily order more printed copies as and when they had funding. We are now creating generic versions of all these tools so that anyone else can set up their own version of a Neighbourhood Ideas Exchange (NIE), can download and make up the notebooks and other tools. We’ve completed versions of the existing 4 notebooks – Experiences, Managing a Problem, Communicating a solution online, Things To Do – and are writing a general guide to the toolkit and NIE concept. We’ve also been condensing our experiences working in Pallion, as well as many years experience working with other communities both here and abroad, into a playful set of StoryCubes designed to help communities, facilitators and organisers think through the different kinds of steps needed for something like a neighbourhood ideas exchange or other community network. We’re hoping to have the whole toolkit finished in time for the AHRC Connected Communities Showcase on 12th March, where we’ll be showing materials created for our other collaboration with ISG on the Hidden Families project.